What an amazing day!!! It was one of the best ones I’ve had in probably two years! 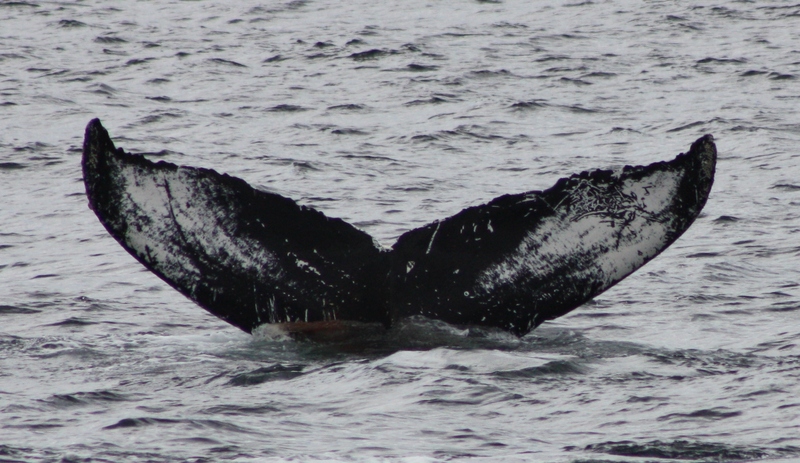 We went south down to Stellwagen Bank and encountered so many whales! 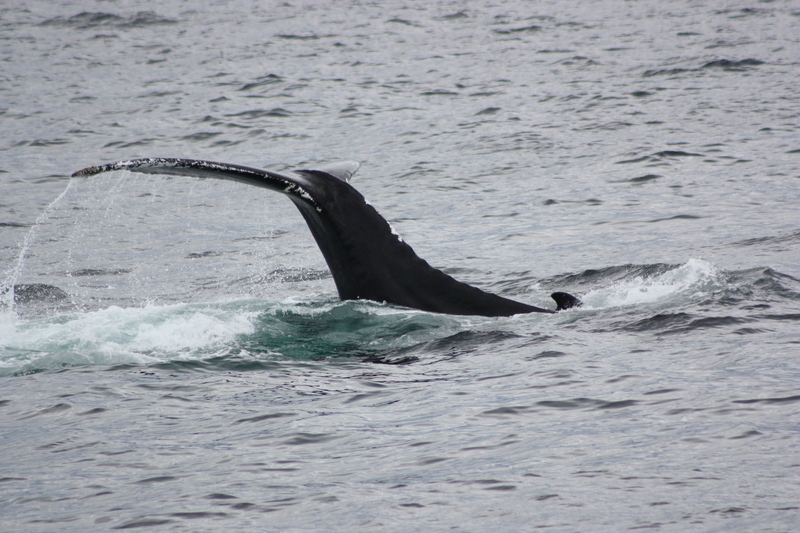 We started with two fin whales then continued further south. Hancock and another whale were moving around–we figured out looking for fish. After a few surfacings, they both came up with their mouths wide open and full of food! 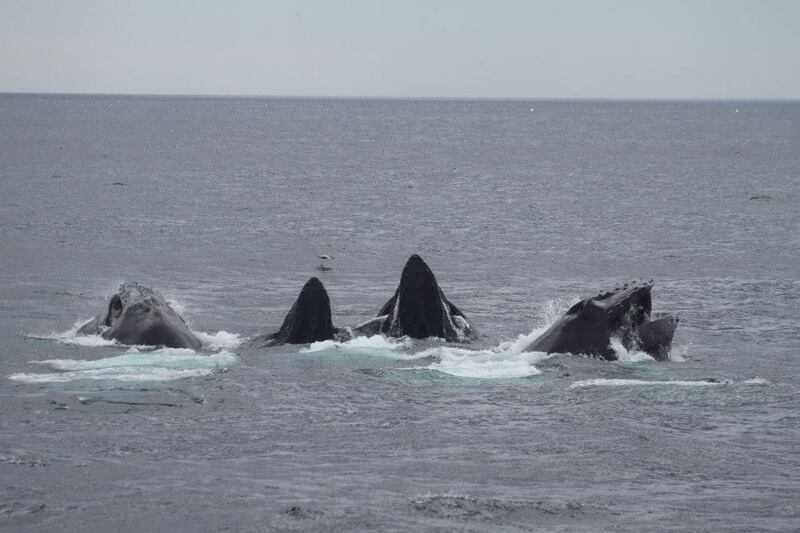 We watched for a few more feeding sessions, and then moved a little further north to watch six more whales. Hancock was born in 1991 to Clipper. The first pair of whales that we saw were Glostick and her new calf. She has such a great feeding style! She kicks her tail 4 times, progressively higher every time! Then she would come up with her mouth full. Her calf was just busy swimming around, not paying attention to the feeding mom! Pretty soon, we started to see fish at the surface all over the place. We still aren’t sure what they were. Even looking at pictures, some definitely look like mackerel and some look like sand eels. Maybe both were there. What we do know is that the whales were feeding over and over on something. At one point all four females came to the surface with their mouths open! It was amazing!!! Check out this picture from Nancy Heins! The groupings were switching up and changing the entire time it seemed like. We saw Pepper, Bayou, Milkweed and calf and Glostick and calf. Check out the white scars on the top of the tail stock as well as where the tail meets the tail stock. These scars are from an entanglement. Of these six whales that we spent most of our time with, 3 have been impacted by humans. Bayou was hit by a boat years ago and is missing half her tail. Pepper was entangled in fishing gear years ago, and Glostick has scars on her tail stock that are from a previous entanglement. We always suggest using seafood guides and buying local! We hope to get out on the water later this week! We will keep you posted!